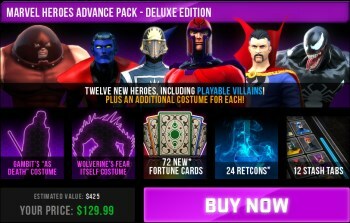 Marvel Heroes developer Gazillion Entertainment says the game's $129 "Advance Pack" DLC is actually a pretty good deal. First things first: The free-to-play MMO Marvel Heroes began offering two "Advance Pack" DLC releases earlier this week, a standard edition at $99.99 and a deluxe for $129.99. Both packs include 12 heroes, some Fortune Cards, Retcon Devices and Stash Tabs, while the deluxe pack also comes with alternate launch costumes, special duds for Gambit and Wolverine, more cards and other stuff. And it's 130 bucks. Even more interesting (or perhaps concerning, if you're of that mindset) is that none of the characters or costumes in the packs have a release date. "Release dates on heroes and costumes included in this pack are to be determined, but are very likely to occur throughout 2014 and early 2015," the site says. "In the Deluxe Edition, Gambit's 'As Death' costume and Wolverine's 'Fear Itself' costume will be delivered to you one month before release in the store. However there is no official release date for either costume yet." You might think that 130 clams for content that might come out next year, or maybe the year after, is a little uncomfortably steep, or perhaps even flat-out crazy. But Ivan Sulic, Gazillion's senior VP of marketing, doesn't see a problem. "Taking pre-orders for digital goods (even undated goods) is not an uncommon practice," he told VG247. "Season Passes permeate the console market, subscription MMOs still exist, and Digital Collector's Editions are routinely presold well in advance of game launches and sometimes in advance of games even having launch dates." It's a fair point, and the Advance Packs are heavily discounted: The content in the deluxe pack would normally go for $425, while the standard edition is worth $215 if sold separately. "We don't think we're setting any precedent with our Marvel Heroes Advance Packs," Sulic said. "Really, we just wanted to get something solid out pre-holiday that we felt was a good offer for our fans." 130 bucks for the promise of DLC - is it a deal? Or do you think it's something a little more uncomfortable?